Churnet Bouldering is a comprehensive guide to the magical sandstone bouldering in the Lower Churnet Valley. Located just south of the Peak District National Park boundary and neighbouring the Alton Towers theme park, the Churnet features some of the best bouldering in the Peak area. This guide features never-before documented venues, such as Farley Woods and Threapwood Woods, as well as classic venues, including Cottage Rocks and Wright's Rock. Over 600 problems are included and grades range from Font 3 to 8a+, with a particularly high concentration of Font 5s and 6s. 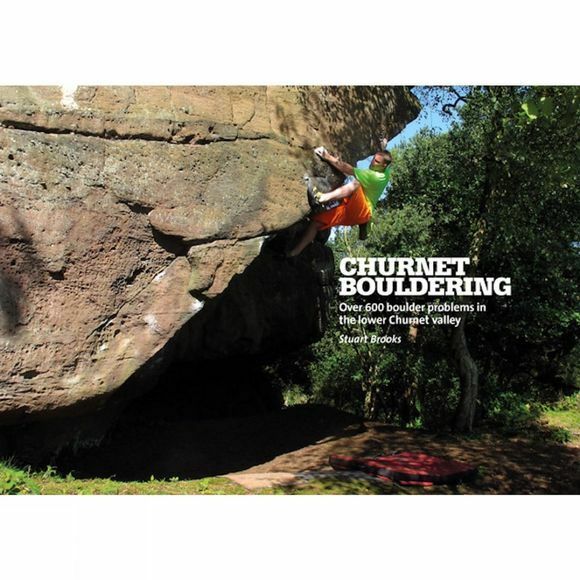 Meticulously researched over several years, Churnet Bouldering is written by Stuart Brooks, one of the area's most active developers, supported by a team of local climbers. Problem descriptions are accompanied by photo topos and maps, and there are detailed notes on access and conditions – especially important in the Churnet – as well as a host of other important information. Stuart Brooks developed a love for the outdoors during childhood while on family walks in the Peak District, Lake District and in Scotland. His first taste of rock climbing was with the local scout group and, aged 15, with a regular climbing partner, he began to tick his way through the Peak's classic gritstone and limestone routes. While he enjoyed climbing the classic testpieces, he found far more pleasure exploring and bouldering in the esoteric corners of the Peak. In the late 1990s he stumbled into the Churnet for the first time and began a relationship with the area which continues to this day.